Combine your run with a little something extra to maximise the workout’s effectiveness. ‘If one is good, two is better’ may not always be true. (Case in point: pre-race espressos.) But pairing your usual run with another workout can make both elements more effective – as long as you’re careful to make the right match. Think of it like a maths equation: when you add strides to an easy run or do strength training after a speed workout, the ultimate benefit – extra-fresh legs, or the opportunity to take a complete rest day, respectively – is more like multiplication than just simple addition. It’s important, however, to be strategic. Stacking two workouts together for quantity’s sake isn’t the goal. Instead, you want the two to complement one another, the way fine wine enhances a steak. These four pairings of a run with something extra can help you reap more benefits from every session. The point of recovery days is to run easy, but maybe not for the whole time. 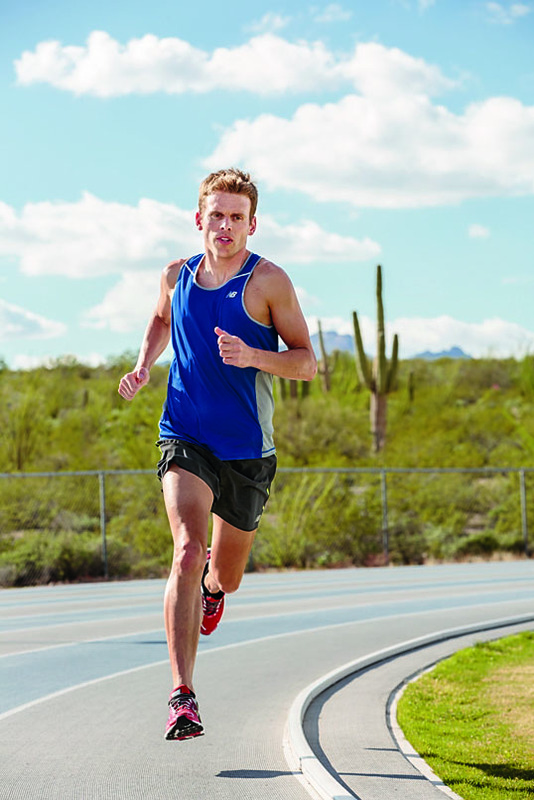 Coach Eric Orton, coach from Born to Run and author of The Cool Impossible, says he tells his runners to finish easy runs with strides – short efforts where you build speed over 50 to 100 metres. “It flushes out the legs just like a massage,” he says, helping you recover from the previous day’s hard effort. Research shows that athletes clear blood lactate (which rises in tandem with by-products that cause fatigue) faster with high-intensity work versus slower recovery jogging. DO IT After an easy run, do six or seven strides: start slowly, then build speed over the course of 100 metres. Once you reach a hard pace, slow down and recover. You logged 25 kilometres before your still-sleeping family knew you were gone so you’d have time for errands. Sound familiar? Coach and Olympian Ryan Bolton says it can be hard to unwind after a long run, but doing so is crucial for the recovery process. One study found that after 2.5 hours of running, athletes had elevated levels of the stress hormone cortisol, which can suppress your immune function. But several studies have shown that yoga and meditation can help bring cortisol levels back down. DO IT Directly after your run, refuel and rehydrate. Later in the day, make time for light yoga, meditation, or a massage. If you choose yoga, focus more on moving and breathing than going deep into stretches. Doubling may help you fit in all your workouts (and rest days). “If I give an athlete a strength-training workout and a quality run on Tuesday, it means that Wednesday can be a real recovery day,” says Orton. Do whichever workout is more important first­. For healthy runners, that’s almost always going to be the speedwork. Plus, a 2012 study found that athletes who did aerobic followed by strength training had elevated levels of acute testosterone, which can help with muscle growth and repair. DO IT Run, then do your strength work, immediately or later in the day. 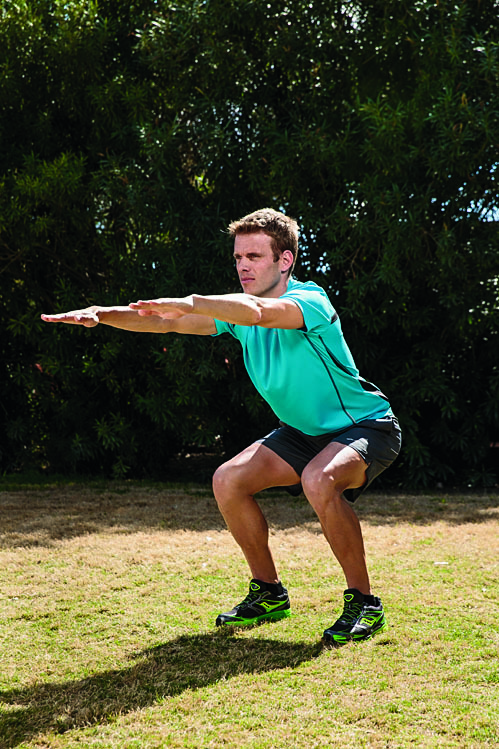 Focus on functional strength moves (like lunges and one-legged squats). Save the next day for easy active recovery. Ever had someone fly by you in the final kilometre of a race? To have what she has, you need workouts that demand stick-to-it-iveness even after fatigue sets in. Bolton gets his elites to do hard hill repeats followed by short tempo runs to build late-race strength. DO IT Bolton suggests doing 15 sprints up an 80- to 100-metre hill. Run the repeats as hard as possible, recovering by jogging slowly on the way back down. After your last hill, head straight into three to five kays of tempo work at your half-marathon race pace. • Begin in a high-plank position with your feet slightly wider than your hips and a neutral spine. Jump and move your feet into a narrow stance, then jump back. • Hold a light medicine ball in front of you. Step back with your right leg into a reverse lunge and twist your torso to the left. Rise, return to centre, and switch sides. • From a side-plank position, lift your top leg slowly, leading with your heel. Hold for 15 to 20 seconds, then lower. Focus on keeping your core steady. Switch sides.